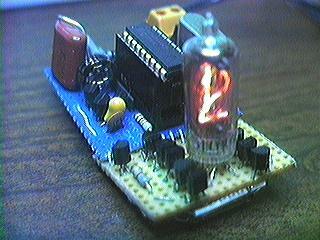 The clock is based on a Microchip PIC16F84A processor, running at 1 MHz. It's rated at 4 MHz, but running at a lower speed reduces its power consumption correspondingly - important since I really had to skimp on the power supply in order to fit it into this small of a space. The software uses 491 out of 1024 words of program EEPROM, and about 42 bytes of RAM. 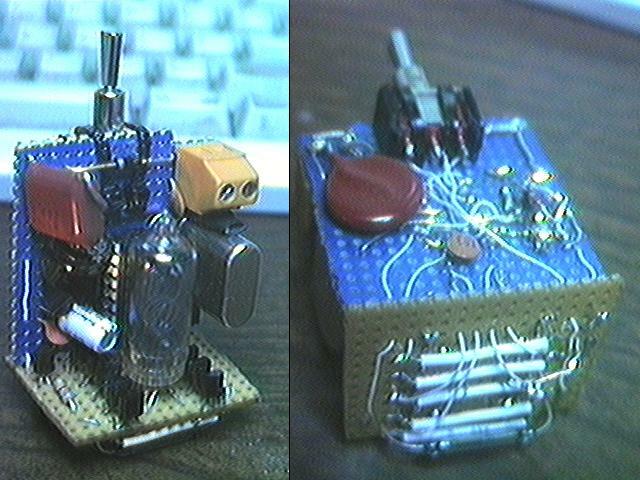 Here's an old picture of the clock's electronics. At this stage of development, I had a low-insertion-force socket plugged into the real IC socket, so that I could pull & replace the PIC for software updates without wearing out its pins or the socket. The LIF socket is about 1/2" tall, preventing the two boards from being folded into their final right-angle configuration. Here are final pictures of the circuitry.